Like the other enclaves in Singapore, Little India would seem quite foreign to most Singaporeans. Rarely do we spend hours, let alone a day walking along the streets exploring the nooks and crannies of these places, unless we’re there to snag up loots from the 24 Hour Mustafa Centre. 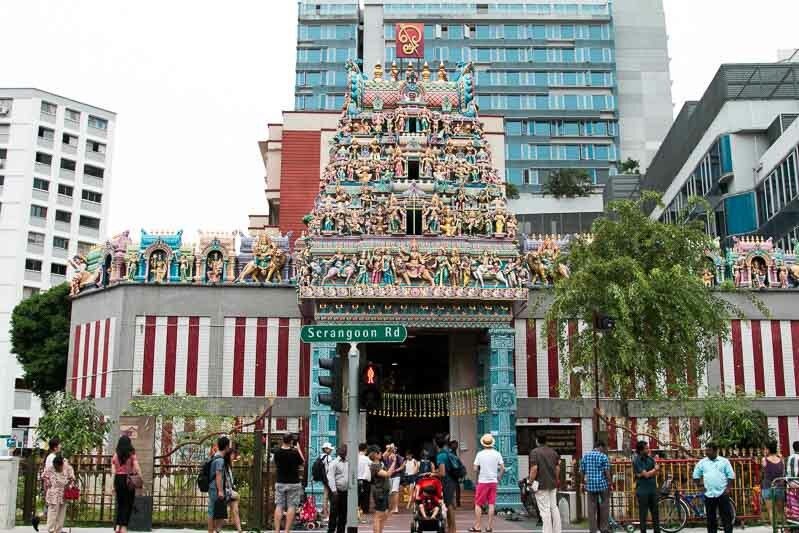 Sure, Little India isn’t as massive, sprawling, modern and air-conditioned as Orchard or the rest of our city’s centre but, within these seemingly maze-like districts are gems waiting to be discovered. Some lying hidden in plain sight as crowds hastily walk by, barely giving certain shops a look. Here are some eateries that you’d definitely have to try at least once in your lifetime in this vibrant, culturally-infused town. With most of us tight on time, we’re not always keen to spend the day wandering aimlessly in search of something quite unheard of or new to us. No time for trial and error? No problem, I did the wandering in the sun so you don’t have to. 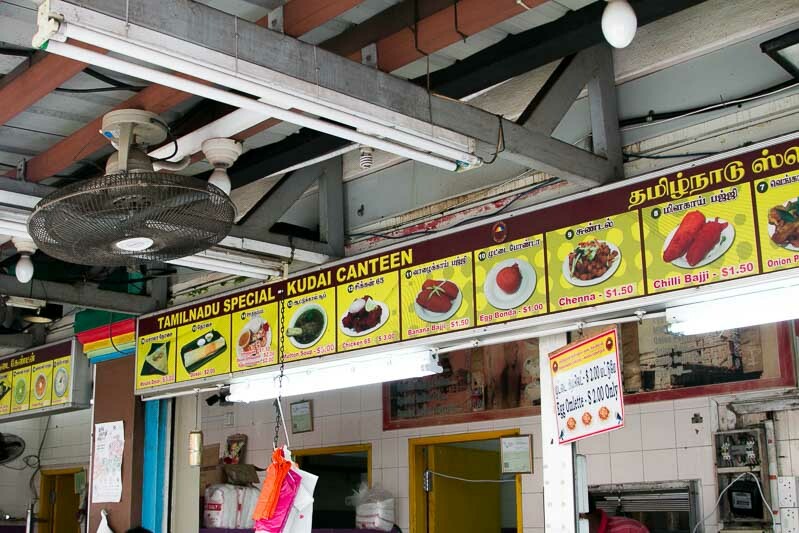 When thinking food in little India, Tekka Market is the first place that often comes to mind. 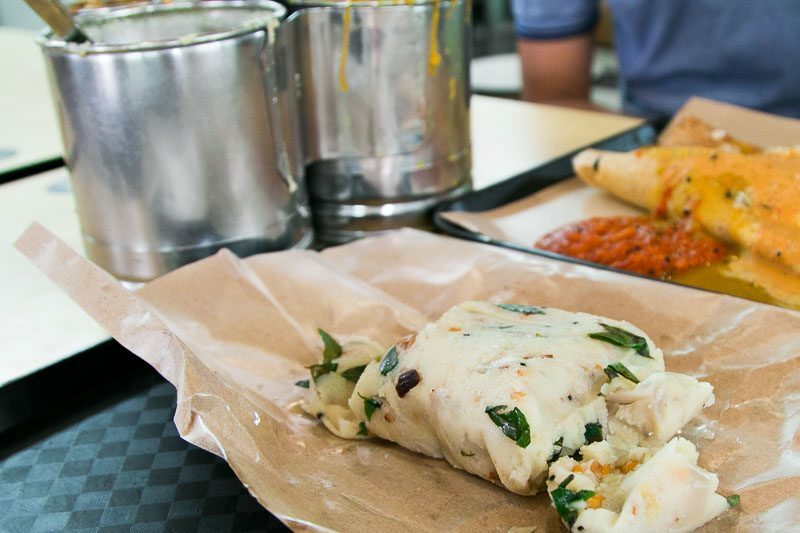 Indian food both North and South dominates the scene at Tekka Centre, which will leave you spoilt for choice if you’re craving for some spice. One of the better known stalls in Tekka Market and those who frequent the area. 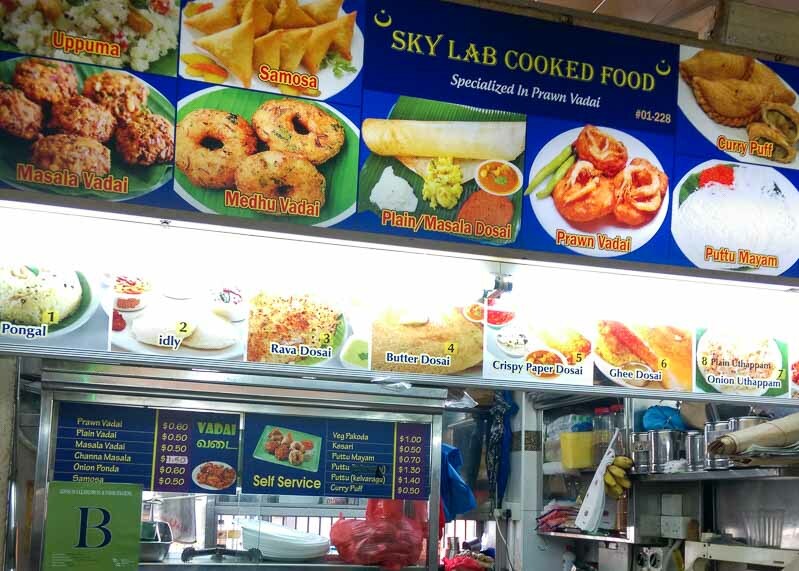 Sky Lab Cooked Food has a variety of Dosai, however, what they’re known for are their Vadai, specifically their prawn vadai ($0.60) if you’re looking. 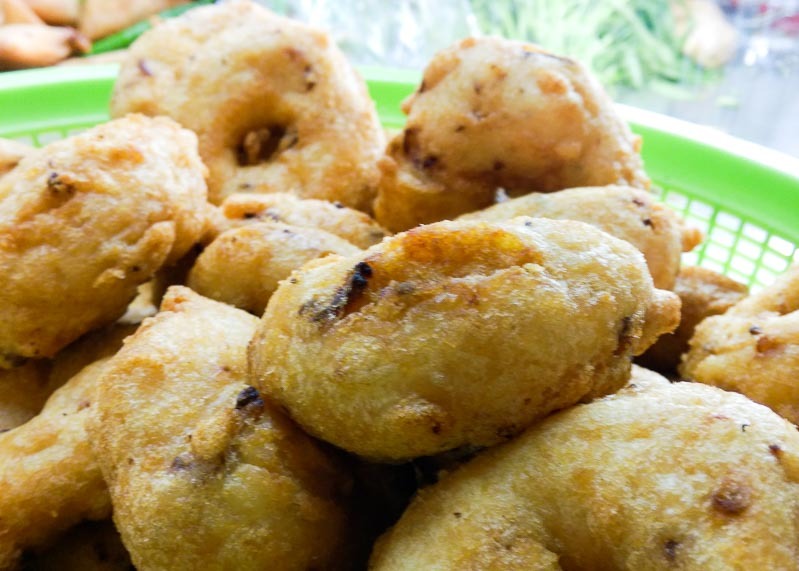 If you’re scratching your head over what vadai is, think savoury Indian donuts usually eaten with green chilli in one hand and the little fried spiced delight in the other. For something (much) more substantial give uppuma ($1.20) a try. Described by others as a porridge made from semolina which is known locally as suji, spices, vegetables and other seasoning, its density makes it appear cake-like when wrapped up long enough. Return it to its thick porridge nature by pouring over dahl and other gravies before chipping away at this breakfast dish of champions, and believe me you’ll feel accomplished upon finishing a whole packet alone. Simple, delicious and very filling. 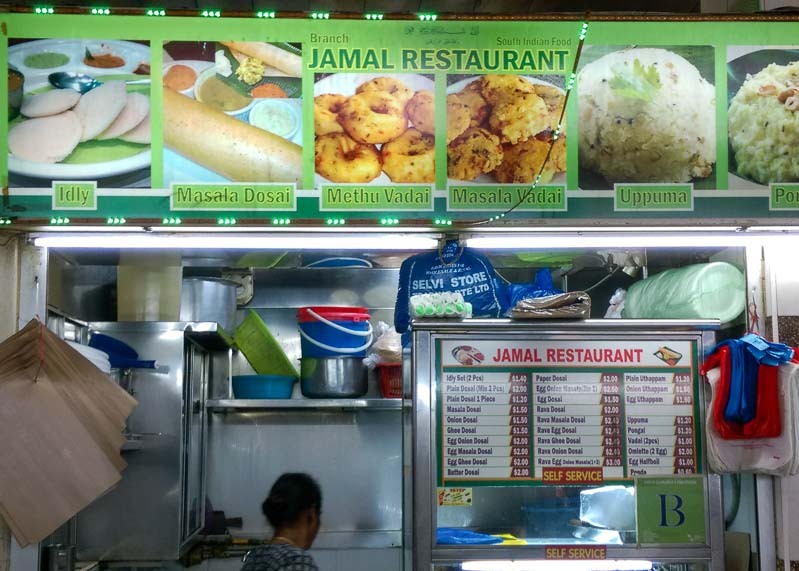 For good Dosai, Jamal Restaurant will be the place to get your fix of these oversized “crepes”. Light and delicate when on its own, opt for the masala dosai ($1.50) which is loaded with a spiced potato mix. Now douse that in the trinity of condiments served with Dosai, namely dhal, coconut gravy and sambar (tomato onion gravy) and you’ve got a delightfully messy medley of spices and flavours. 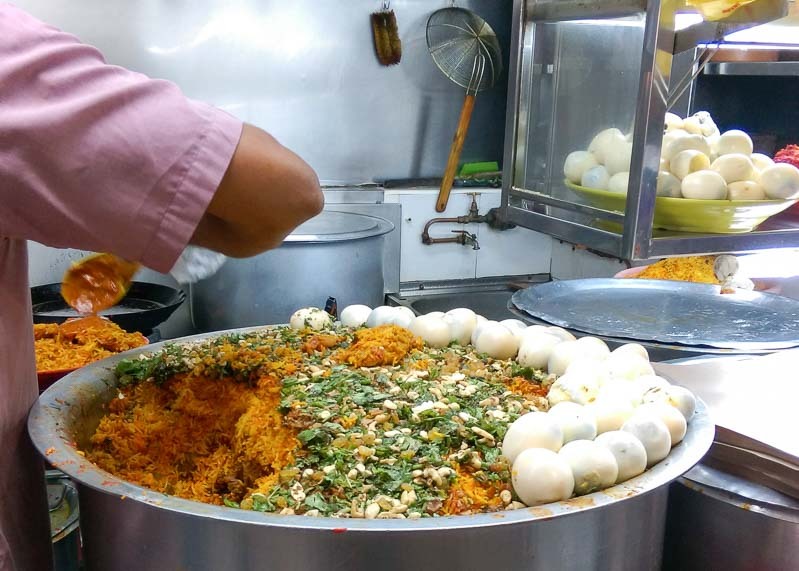 Touted as the best briyani in Tekka Market, it’s not difficult to see why. Dum briyani chicken/mutton/fish ($5.50) are all priced the same, now add an egg and pappadam ($0.50 each) onto the same plate and you’ve got yourself a meal or two. 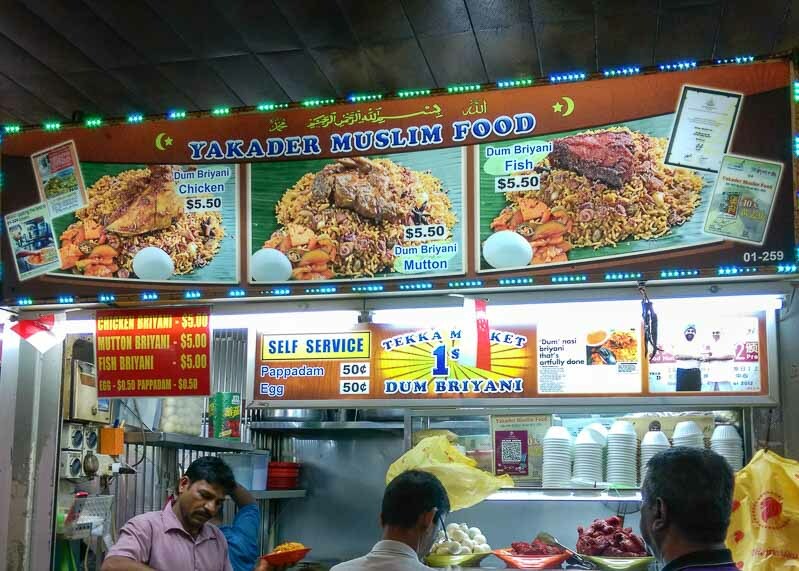 Unlike most briyanis that have overcooked meat and a drier overall texture, Yakadar Muslim Food’s moist rice and tender meat is a sign of briyani done right. Hop right over to the stall for a quick fix if you’re nearby. 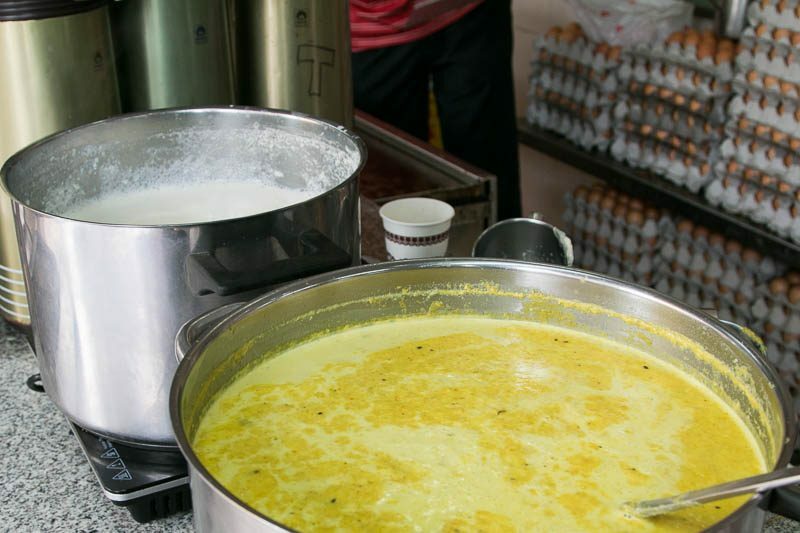 Are you in search of something more familiar or have always been on the lookout for good prata? 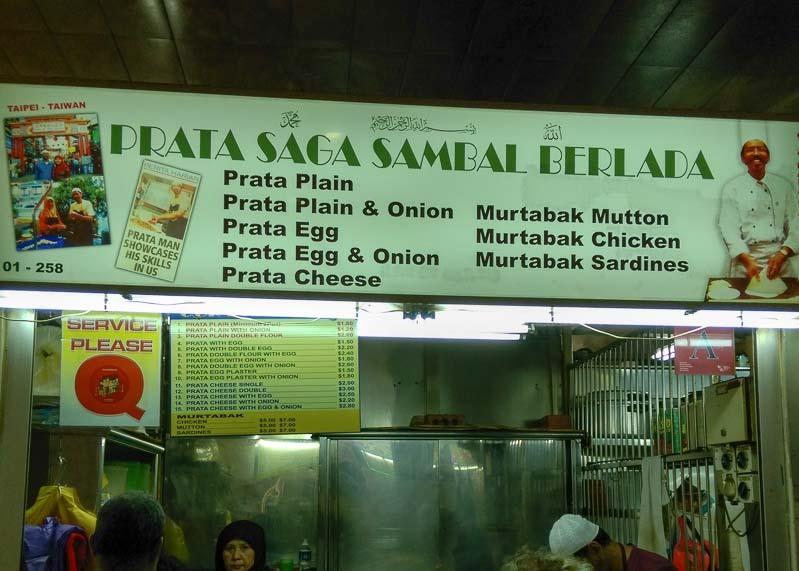 Prata Saga Sambal Berlada will not disappoint, with a relatively simple menu sans the new-fangled creations or abominations often found at some other prata establishments, quality isn’t sacrificed for a list of crazy creations. Kosong that’s fluffy and layered is what I prefer when I order prata kosong ($1.80 for 2), and if you’re feeling a little more generous on your stomach, have the prata double flour with egg ($2.40). Looking to take one, or maybe two for the road? 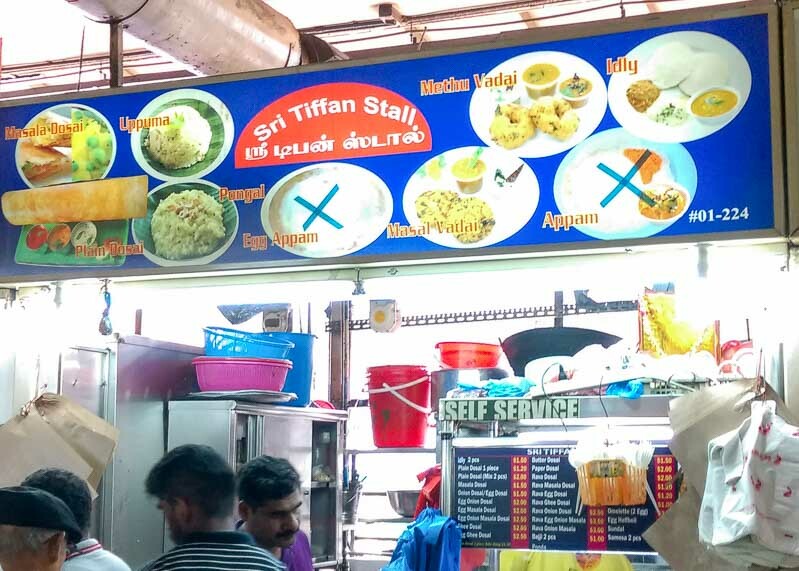 Sri Tiffin sells vadai ($1 for 2), which is very cheap! 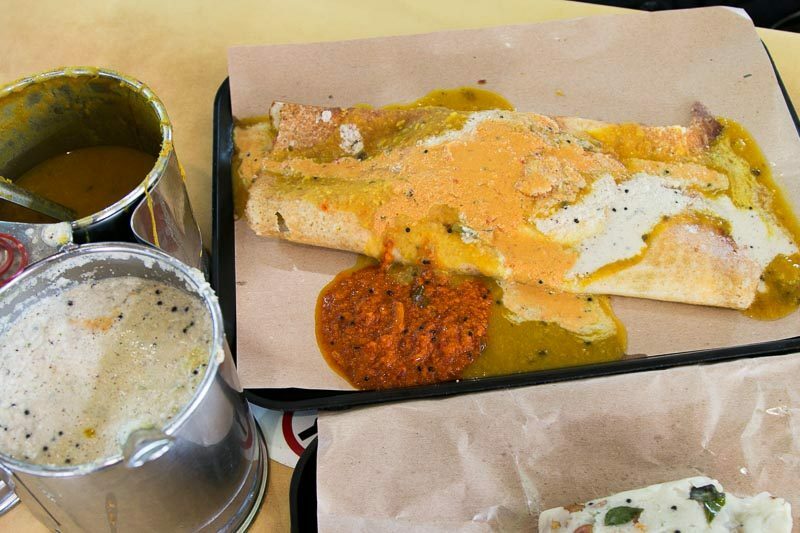 Their dosai is also argued to be one of the best in Tekka Market but, we’ll save that argument for another day. You’d be forgiven for not giving this nondescript coffee shop a closer look, which one first glance looked rather normal. 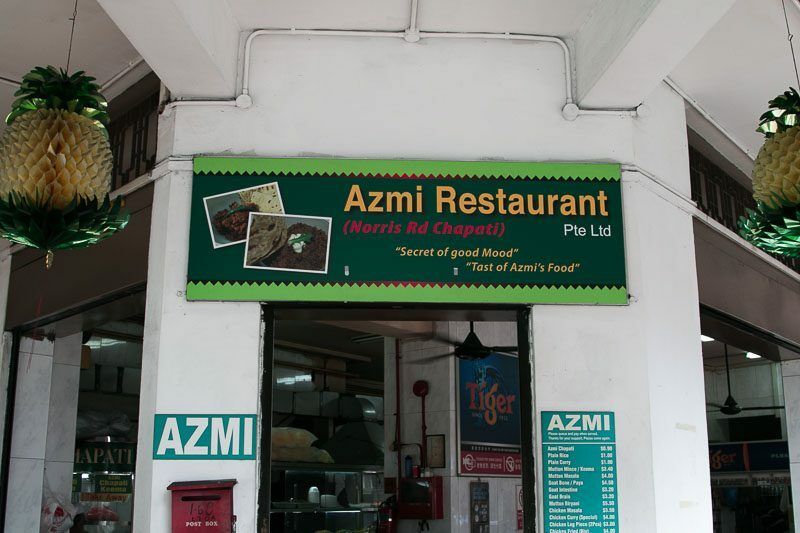 However, Azmi Restaurant reigns supreme within Thye Chong Restaurant with its griddle always fired up and churning out stacks of freshly made chapatis ($0.90 for 2) that are ready-to-go. 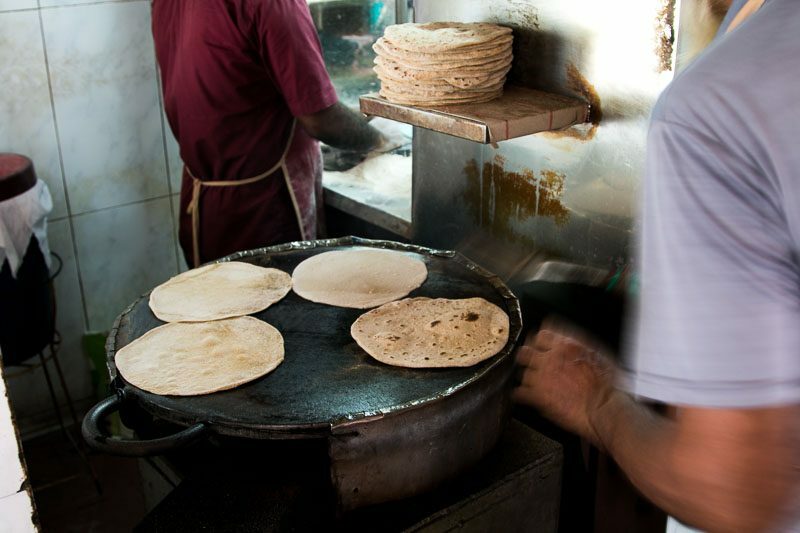 Singaporeans have long celebrated prata, and in recent years, naan. Chapati though, seems to have fallen by the wayside. 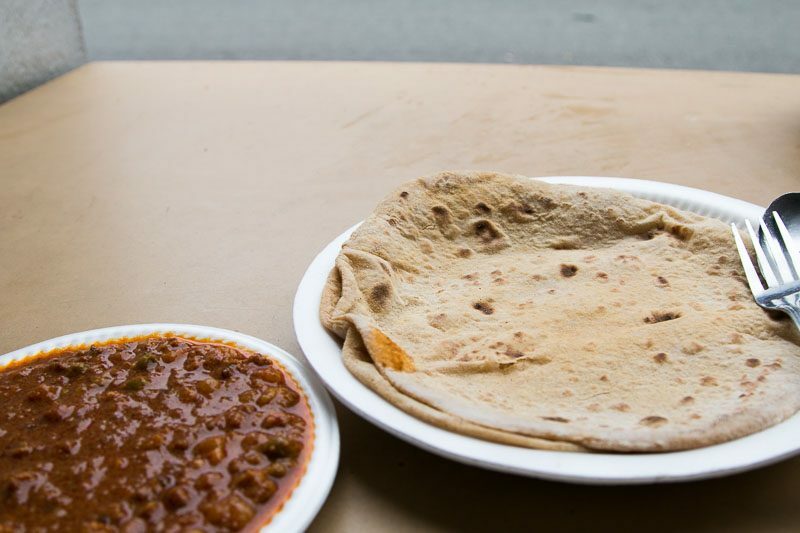 Hot, flaky, doughy and light is how I’d describe the chapati at Azmi Restaurant. If you’re one who takes pleasure in eating freshly baked or toasted bread, this is for you. Spicy minced mutton or keema ($3.40) is a classic accompaniment to chapati. The rather sloppy and unrefined-looking keema doesn’t overpower the way mutton so often can, and was chock full of minced meat, peas and pieces of potato. Sloppy it may look but, you’ll be mopping up every bit of it with chapati. 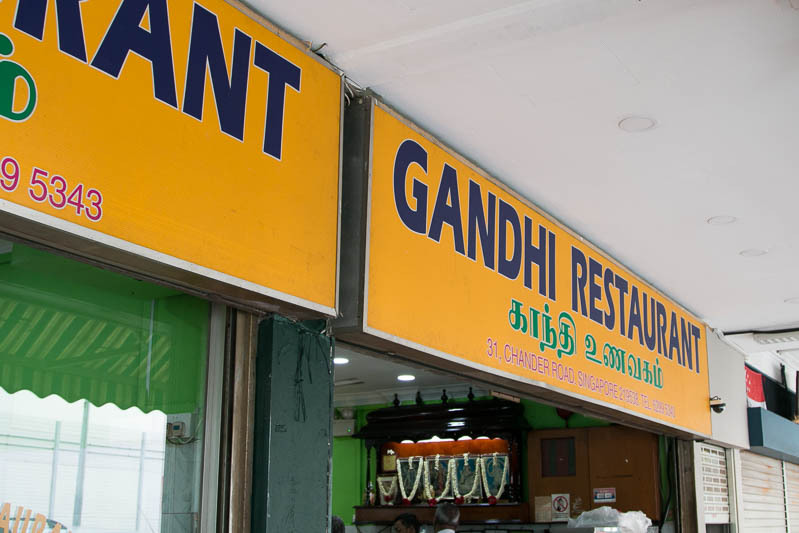 Ghandi Restaurant has been a favourite for those familiar with Little India. If digging into a messy plate of cai fan (mix vegetables rice) or nasi padang helps you attain nirvana, if only for a moment, Ghandi Restaurant will do the same but keep you there longer. 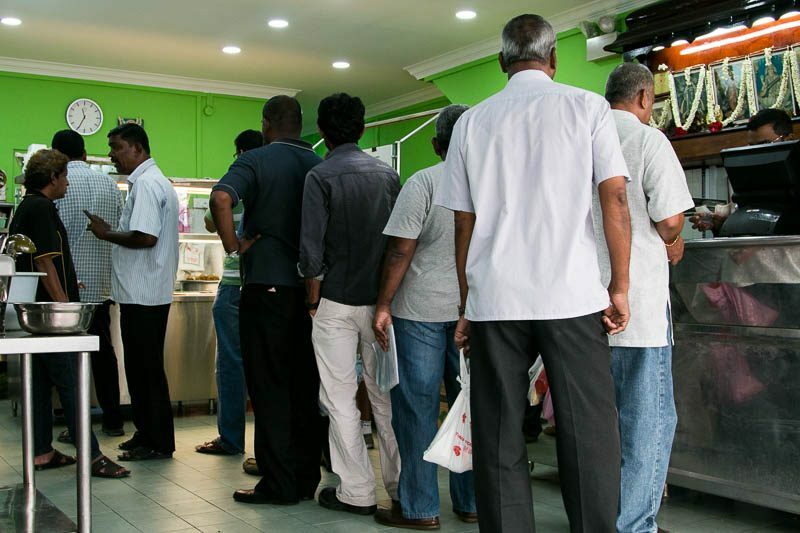 If you’re not convinced, let the queue stand testament to the restaurant’s popularity. I was there at 11:35 am and there was already a lunch crowd. 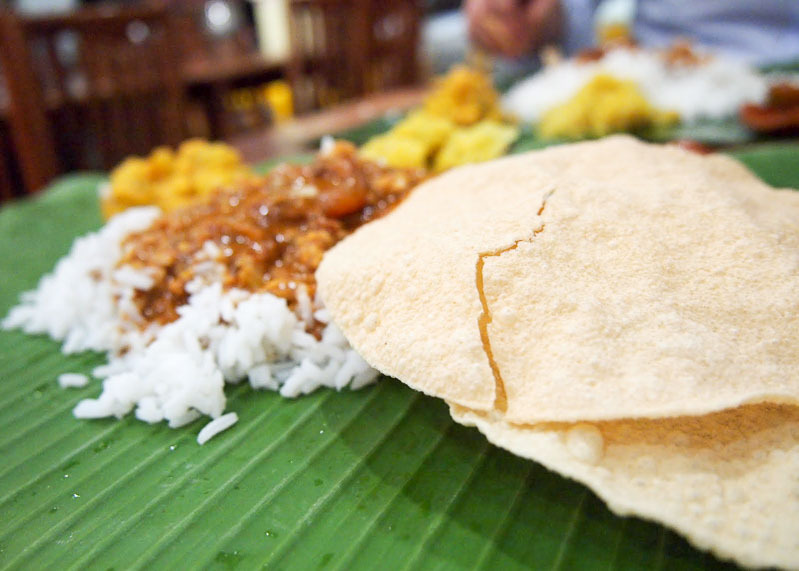 The basic vegetarian banana leaf set ($4.50) is free flow of sorts, with the rice, dahl, cabbage, sambar, curry and papadum topped up on request. Your meat or seafood dishes aren’t unlimited (sadly), still you’ll be able to nurse a food baby with the amount of food you’d be getting for approximately ($7.50). 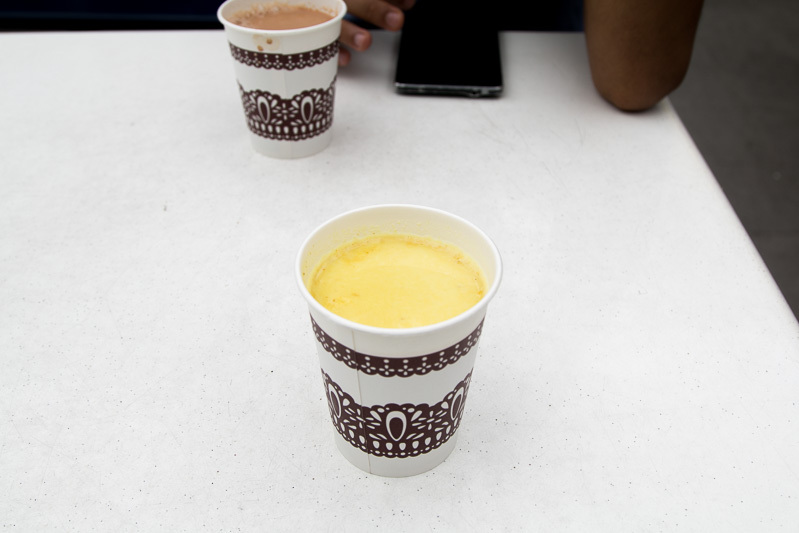 If all the walking around Little India has gotten you weary, and you fancy a spot of tea or masala milk ($1.50), Tamil Nadu Special Kudai Canteen is a hive of activity on Sundays with foreign workers hanging around on their off-days. The amount of beverage in these small paper cups will go a long way for the local palate. Describing it as sweet would be an understatement, so I would recommend an extra cup of hot water to dilute the original serving, making it more enjoyable for those of us not accustomed to the taste. 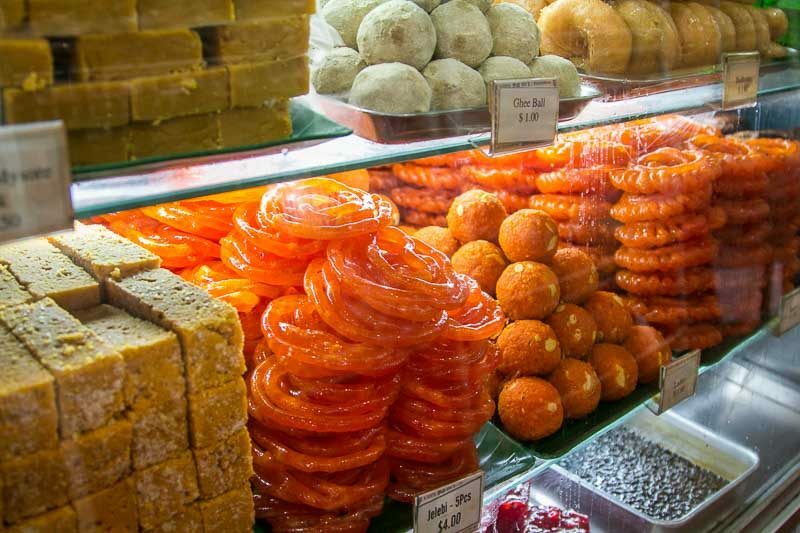 If you have a sweet tooth, a really sweet one mind you, Little India Arcade which is located opposite Tekka Market is home to a couple of shops selling Indian sweets. 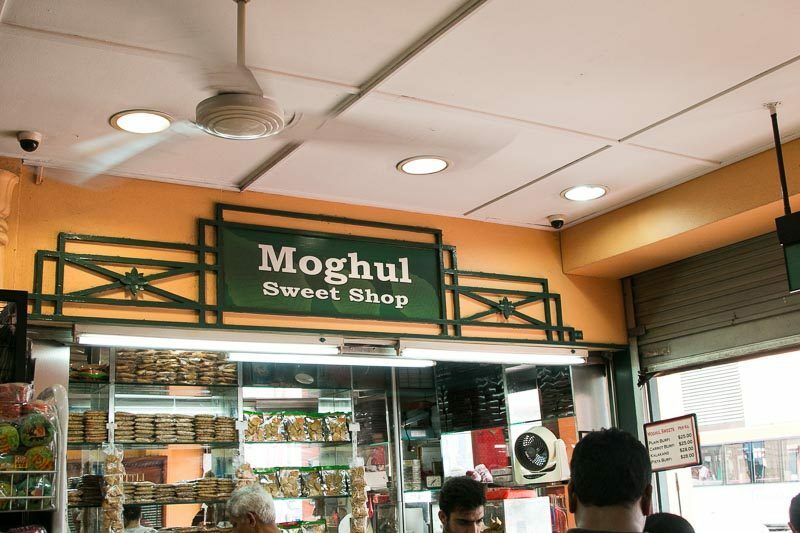 Moghul Sweet Shop is the better known one and their decadent, technicoloured sweets often lure curious tourists to its shop front. 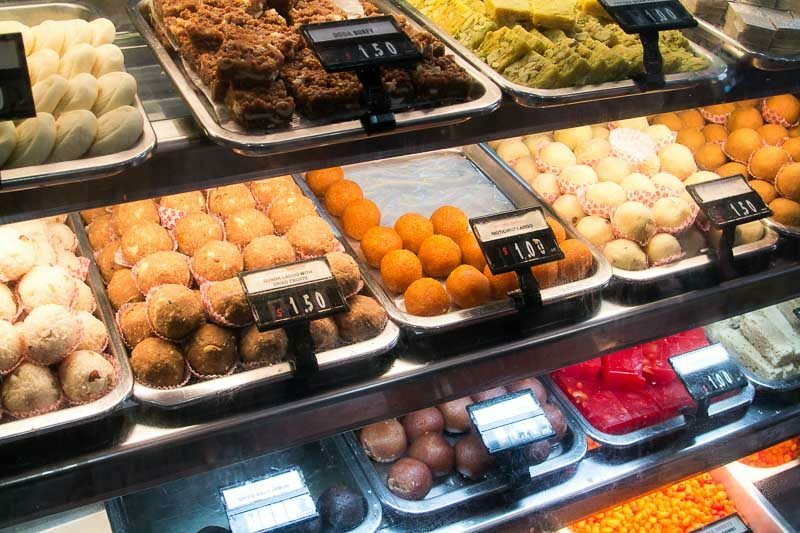 Most items including the Gulab Jamun ($1) a fried ball of dough soaked in syrup should be split among friends so as to sample more of these treats, while avoiding getting a sugar high. 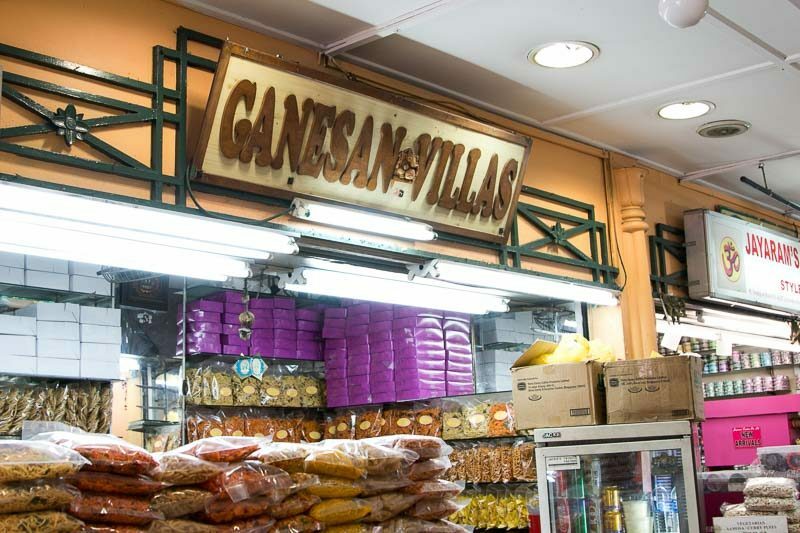 Ganesan Villas is another shop in Little India Arcade in the business of selling treats, though they seem to have a wider variety of savoury ones, I was mesmerised by the colours of the sweets and some of the more sinful ones. 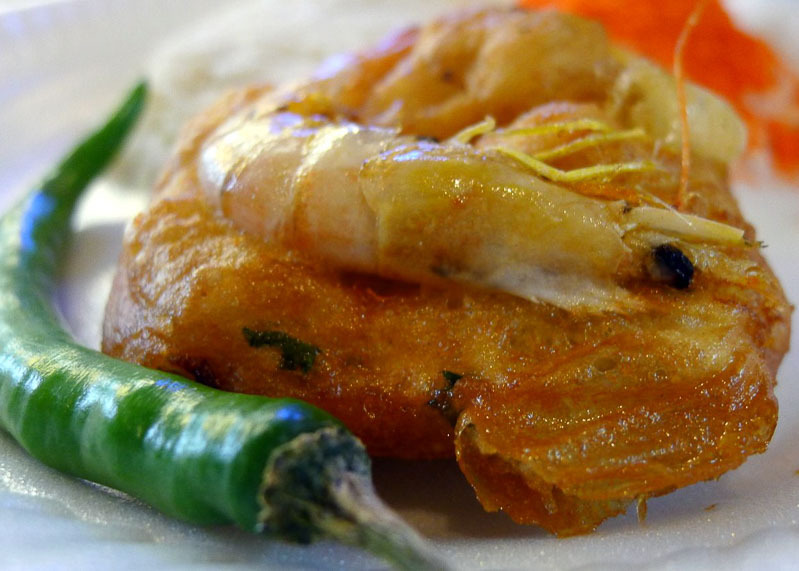 The jalebi ($4 for 5 pieces) is batter that has been deep fried before being coated in an orangey syrup. Not sinful enough? Try the ghee ball ($1). Not as colourful as other sweets, the ghee ball is like an extremely rich peanut ball, with the peanuts replaced by cashew nuts, and as its name suggests, ghee that is then rolled in powdered sugar to ensure a pure sinful indulgence. Navigating Little India’s often packed streets in this oppressive weather can drain one out quickly, making it an area that may not be the most appealing in terms of comfort to spend time at. But, dive in with an open mind and try things for yourself, and you might uncover a new favourite that will have you prospecting for more gastronomic gems. Let us know if you have a favourite haunt in this richly, colourful district of Singapore.